It's probably fair to say that the prettiest villages in Catalonia can be found around La Bisbal d'Emporda. 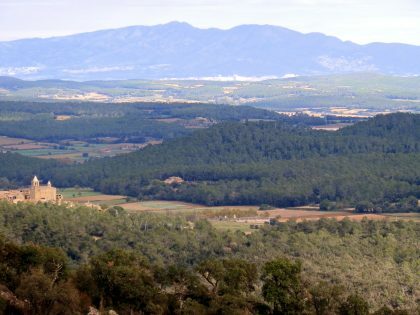 La Bisbal is the 'capital' of Baix Emporda and seat of the bishops of Emporda. In the Middle Ages, this area was fertile and rich in farms and being inland was less open to attack from the sea by the pirate raiding parties. The villages however kept their basic defensive structure of a continuous terrace of houses acting as a defensive wall that encloses in a central town or village square. However this means if you want to see the real ancient heart of the village you have to get out of the car - modern roads skirt the villages leaving the gems of gold-coloured stone houses and cloisters hidden inside, out of view from the road. Monells is exactly one of these types of town. The main road passes through past an unprepossessing church and a tourist office for the Gavarres. Driving through it doesn't look anything special. But if you get out of the car and cross the river into the centre of the old village all of a sudden you are met by restaurant tables spilling across a cobbled town square with alcoves and arches providing shade from the sun. Our walk (c10km) starts in Monells and follows the river out of town towards the Gavarres. To begin with the walk is relatively flat past open farm countryside with old Masia farm house and patches of woods. The walk is pleasant if not spectacular. In the woods the main drive-able path stops and the climb up starts in more earnest. The path is broad but stoney, so good shoes are advised. As you climb the views across the plain of the river Ter come into view. On a clear day Roses and the Pyrenees are visible. The vegetation changes from broad woods to something more sparse as the Alzinas thin out. Towards the top the path switches from one side of the ridge to another giving you views in all directions. Mont-Negre at the top can be reached by car from Quart, but as one of the girls wasn't feeling well, unusually for our walks we came straight back down the way we had come.